Line a 15×10 jelly roll pan with parchment paper. Lay the saltine crackers evenly on the pan. In a saucepan, melt the butter and brown sugar. Bring to a boil and let it boil for 3 minutes. Do not stir it during this time. Pour the caramel evenly across the saltine crackers. Bake for 5-7 minutes. Remove the pan from the oven and sprinkle the chocolate chips across the toffee. Let them melt for a few minutes. Using a spatula, spread the melted chocolate evenly across the toffee. Sprinkle the chopped pecans on the melted chocolate. Let the toffee and chocolate cool completely. 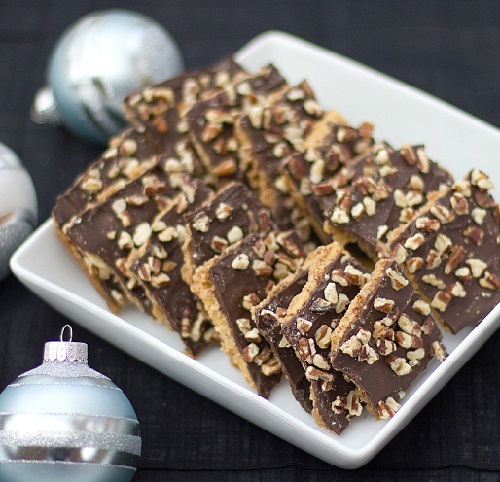 Break the toffee into 2 inch bite size squares. To store, keep in an airtight container for 1 or 2 weeks or in the freezer for a couple months.